The new, typing based game-mode will be made available in the free Encore update to the game. Skullgirls: Encore isn't just developer Lab Zero Games breaking away from its... complicated relationship with publisher Konami, it also adds some new features. During a Twitch stream, lead developer Mike Zaimont revealed the new Typing of The Skullgirls gamemode, no doubt inspired by the surprise release of The Typing of The Dead: Overkill earlier in the year. 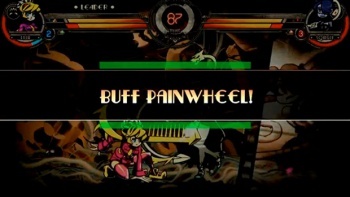 In Typing of The Skullgirls, your meter will slowly fill up automatically. Once a super move is executed, players must type a variety of words as quickly as possible, which then awards damage bonuses based on speed. Perfectly typed words will increase a super's damage output by 1.5 times, whereas a "right but not perfect" typed words will do normal damage. Misspelled words will reduce damage dealt by 10 percent. When you are defending against an AI's attacks, you can subsequently reduce damage by typing. Zaimont's comments on the mode suggest that it is a singleplayer-only affair, that it would be kind of cool to have two players stand off with both fightsticks and keyboards at the ready. The mode will obviously be available for the PC version of the game, but you'll also be able to play it on the Xbox 360 and PS3 versions of the game, when the Encore update releases next year.